High Steaks Steakhouse at Thunder Valley Casino Resort: This Month's Recipe: Summer Gazpacho! 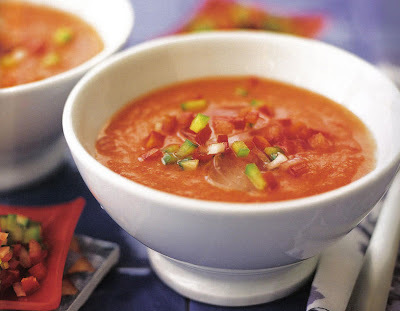 This Month's Recipe: Summer Gazpacho! Mix tomato juice, lemon juice, water, olive oil, chives and parsley together. Sauté onion and peppers until onions are translucent. Add minced garlic and cayenne. Cook for an additional 30 sec. to a minute. Remove from heat and cool. Add sautéed items to liquid ingredients and blend mixture until smooth with an emersion blender (small batches at a time in a blender will achieve the same results). Then chill in the cooler for about three hours. Before serving add fresh diced cucumber (skin on), diced Roma tomatoes and season with salt to taste. Serve cold and garnish with croutons. Yields 8 cups.